For 60 formative years the Santa Fe Trail, from Missouri into Mexico, was a vital route for commerce, emigration and military transport. Billed as America’s first international highway, the trail now consists of sometimes visible wagon ruts in the prairie with historic sites scattered along its 900 miles. The trail was born in the adventurous mind of frontiersman William Becknell. Becknell, living in Missouri and deeply in debt, was fired by tales of the explorations of Zebulon Pike and Lewis and Clark. Gambling that Mexico’s recent independence from Spain would prompt the new nation to open its borders to trade, he gathered a party and headed West in 1821. They stuck to the United States side of the Arkansas River until they came to the site of what would become La Junta and crossed the river south into what was then Mexican territory and on to Santa Fe. They were welcomed by the Mexicans and quickly sold the trade goods they had brought by mule. The news spread quickly and their track became the Mountain Branch of the trail, the first international trade route in the United States. The rich trade potential required greater carrying capacity and wagons quickly replaced mules. The wagons dug ruts into the prairie that can still be seen today. But when travelers reached rocky Raton Pass through the Sangre de Cristo mountains, the trail took the upper hand. Wagons sometimes had to be dismantled and hauled by hand over the steep and unforgiving pass, adding days to the journey. Many discouraged by the Raton Pass took a detour, the Cimarron Cutoff, through northeast New Mexico, the present Oklahoma Panhandle, and into what is now southwest Kansas. The cutoff was 100 miles shorter, but the tradeoff was a long, waterless slog through Comanche and Kiowa territory. The natives first charged for passage in meat and other commodities, but as they felt greater pressure from the newcomers, bloody attacks became common. By the 1840s, the cutoff was all but abandoned. 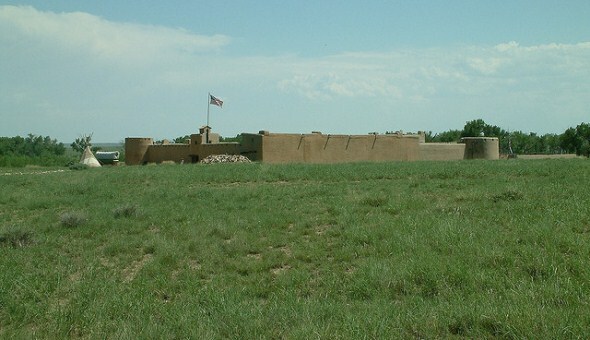 The construction of Ft. William, later known as Bent’s Fort, in 1833 near present-day La Junta reassured many travelers, who returned to using the Mountain Branch. Brothers William and Charles Bent built the privately owned adobe fort as a trading center with Plains tribes. The fort’s success was boosted significantly when traders returned to the Mountain Branch. When the Mexican-American War broke out in 1846, U.S. troops followed (and improved) the original trade route to invade Mexican territory. Bent’s Fort became a staging area for the troops. After the American victory in 1848, the Santa Fe Trail led not to Mexico but to newly acquired U.S. territories. The improved trade route now carried military freight to supply a string of forts along the trail. Stagecoaches rattled along the route and a flood of trappers, emigrants, miners heading for the gold fields and adventurers taken by the allure of the West made use of the Santa Fe Trail. One of those emigrants, Thomas Boggs, stopped his journey at Bent’s Fort in 1843 where he worked for the Bent brothers and eventually married the stepdaughter of one of the brothers. In 1862 the couple moved to a lush spot at the confluence of the Arkansas and Purgatory rivers near present-day Las Animas and established the first non-military settlement on the Santa Fe Trail. Boggsville became an a welcome stopping place for travelers, protected by nearby Ft. Lyon and a uniquely peaceful community of ethnic diversity inspired in large part by a Cheyenne woman, Amache Ochinee, who married white settler John Prowers and served as a bridge between the two worlds. The inevitable progress of rail lines pushing westward sped significantly in 1878 when the Atchison, Topeka and Santa Fe railroad beat the Denver and Rio Grande railroad in crossing Raton Pass. The rail lines finally reached Santa Fe in 1880. The history-making Santa Fe Trail faded back into the prairie grass. Many of the lively settlements dotting the trail all but disappeared, while others prospered and adapted. Travelers today can follow the old trail by car on Highway 50 from the Kansas border through La Junta and Highway 350 from La Junta to Trinidad. Stops include a recreated Bent’s Fort and a living history museum at Boggsville, which is being renovated and recalls the lives of those who lived a vivid chapter of Western history.